So, what’s he eating these days? 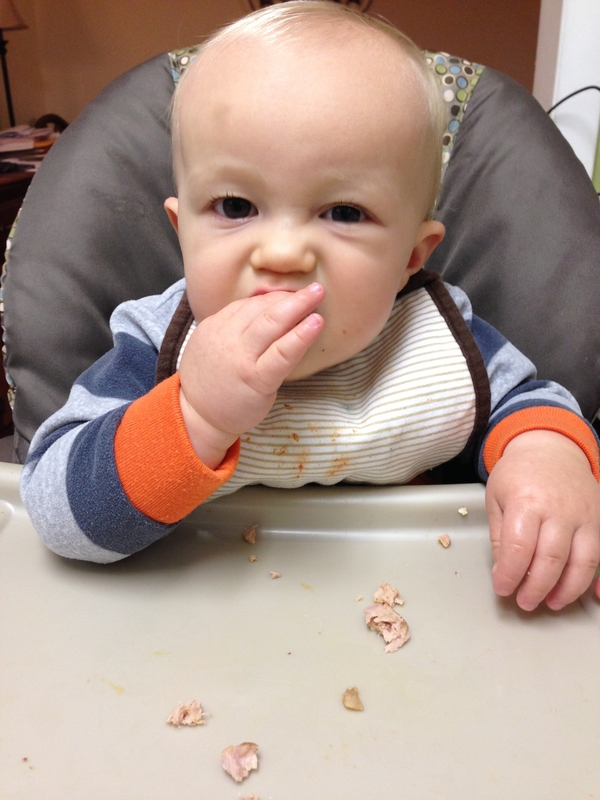 JM loves meat. And who can blame him? Meat is sooooo good 🙂 In particular, he loves chicken sausage, ground beef, stewed beef, deli turkey and ham, and grilled chicken. Oh, and bacon. Yes, he is definitely our son. He also loves scrambled eggs and quiche. I’ve made him ham and cheese quiche in the past, but the other day James fed him some quiche that had rotel tomatoes in it, which was a little spicy to me, but JM just ate it up. 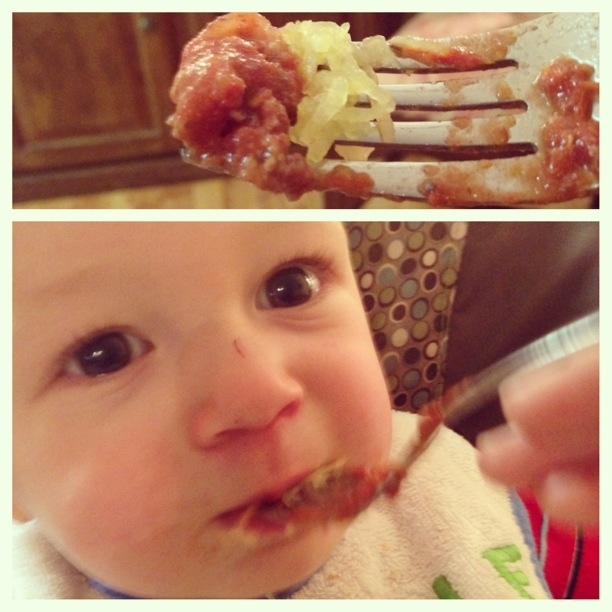 He’s also starting to enjoy our meals, and loves spaghetti squash with marinara as well as poppy seed chicken casserole. No baby utensils for him, we only use the real deal now. He also does well eating oatmeal in the mornings, and of course he has to help me put the spoon in his mouth. When it comes to dairy, he gets a 6 ounce bottle at bedtime, then a small bottle when he wakes up early in the morning (which I would love to phase out), and a sippy cup with milk throughout the day. We also give him plain full-fat greek yogurt and typically mix it with a fruit puree, such as prunes. 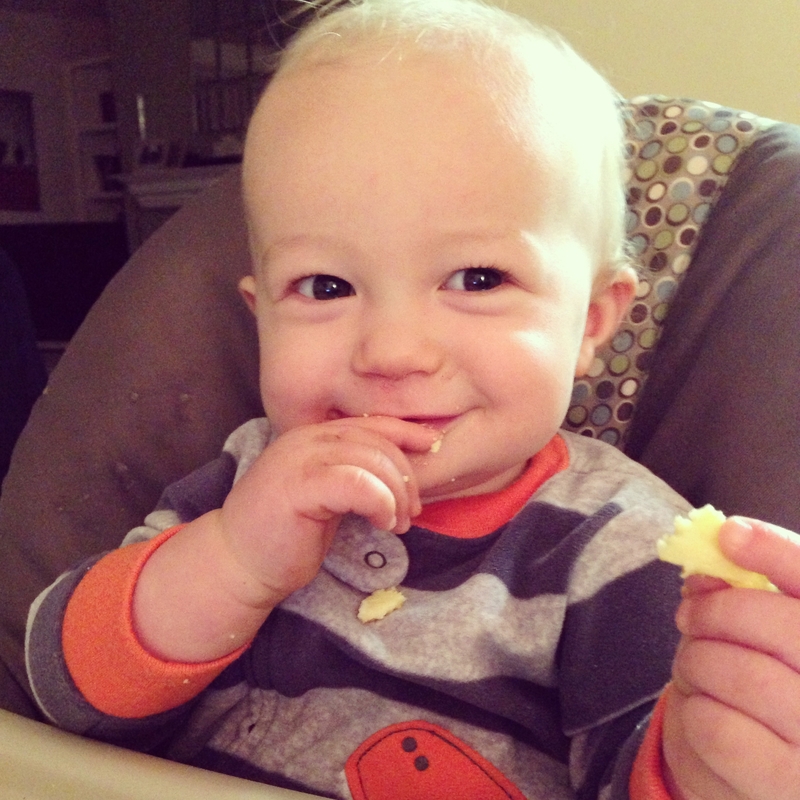 And cheese, oh this boy loves cheese like his mama. We give him full-fat mozzarella and variations of cheddar. I did let him try a bit of feta the other day and that was a little too much for him. He has really started eating all kinds of fruit, strawberries, cantaloupe and blueberries being some of the most common ones lately. I’m struggling with getting him enough veggies. Oftentimes, I revert to the fruit and veggie puree pouches for convenience when we go to the gym in the afternoons, and because it’s an easy way for him to get in veggies. I will say that the boy loves salad, when there is a good dressing. Two weeks ago, we went out to dinner for my Grandmother’s birthday and he was picking pieces of salad off my mom’s plate. Because JM goes to an in-home daycare, I’m lucky to be able to send him with a lunch. Typically, I make a tray of food like the one above, which lasts him about two days. Sometimes, I’ll send him leftovers like spaghetti squash with meat sauce. As much as I wanted him to eat the cucumbers and red bell pepper, that didn’t go over so well. And I can’t really blame him, because without molars those are nearly impossible to gum. 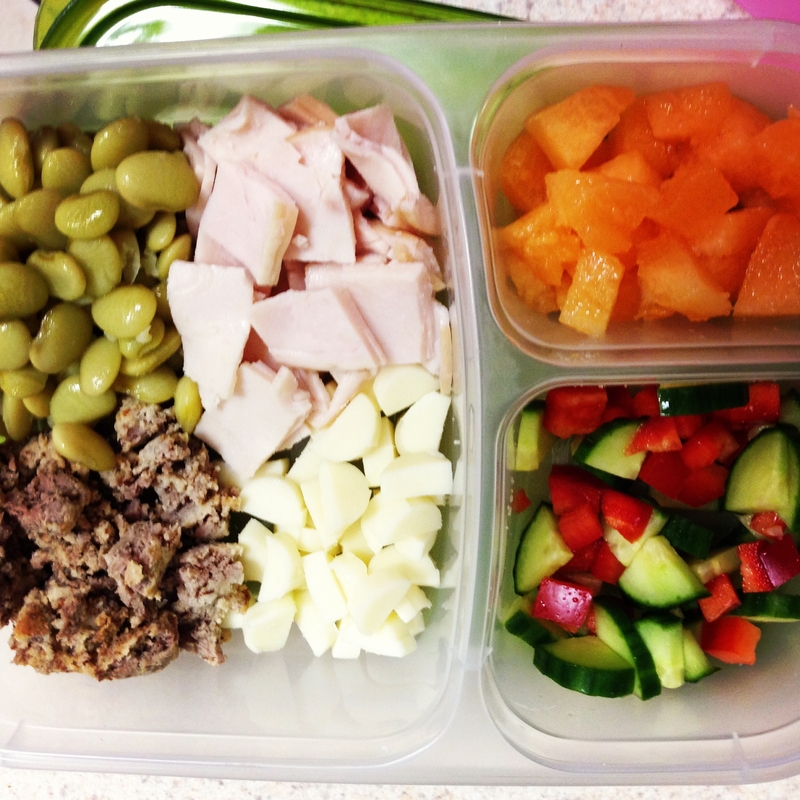 But I send him all sorts of things in his lunches so that he can get used to a variety of flavors. I’m linking up with Brittany for Munchkin Meals.